Dean Kamen (b. 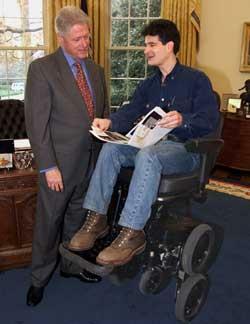 1951) demonstrating his iBOT invention to President Bill Clinton in the Oval Office. In 1641, the first patent in North America was issued to Patent Act of 1790 (1 Stat. 109) into law which proclaimed that patents were to be authorized for "any useful art, manufacture, engine, machine, or device, or any improvement therein not before known or used." On July 31, 1790, Samuel Hopkins of Pittsford, Vermont became the first person in the United States to file and to be granted a patent for an improved method of "Making Pot and Pearl Ashes." The Patent Act of 1836 (Ch. 357, 5 Stat. 117) further clarified United States patent law to the extent of establishing a patent office where patent applications are filed, processed, and granted, contingent upon the language and scope of the claimant's invention, for a patent term of 14 years with an extension of up to an additional 7 years. However, the Uruguay Round Agreements Act of 1994 (URAA) changed the patent term in the United States to a total of 20 years, effective for patent applications filed on or after June 8, 1995, thus bringing United States patent law further into conformity with international patent law. The modern-day provisions of the law applied to inventions are laid out in Title 35 of the United States Code (Ch. 950, sec. 1, 66 Stat. 792). A spinner is a type of hubcap that spins independently inside of a wheel itself when the vehicle is in motion, and continues to spin once the vehicle has come to a stop. Being an attachment to the car's wheel, spinners operate by using one or more roller bearings to isolate the spinner from the wheel, allowing it to turn while the wheel is at rest. The invention of the spinner is credited to James J.D. Gragg of Tulsa, Oklahoma who filed a patent on October 28, 1992 and was issued U.S. patent #5,290,094 on March 4, 1994. A CMOS image sensor (complimentary metal-oxide semiconductor) is an image sensor consisting of an integrated circuit containing an array of pixel sensors, each pixel containing a photodetector and an active amplifier. 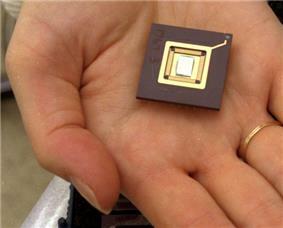 Starting at the same point, they have to convert light into electrons by using the CMOS process. CMOS image sensors can be found in digital SLR cameras, embedded web-cams, video cameras, automotive safety systems, swallowable pill cameras, toys and video games, and wireless video-security networks. 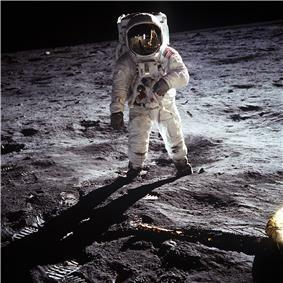 The CMOS image sensor was invented by renowned American physicist and engineer Eric Fossum while working at NASA's Jet Propulsion Laboratory in Pasadena, California. On January 28, 1994, Fossum filed U.S. patent #5,471,515, which was issued to him on November 28, 1995. DNA computing is a form of computing which uses DNA, biochemistry and molecular biology, instead of the traditional silicon-based computer technologies. DNA computing, or, more generally, molecular computing, is a fast developing interdisciplinary area. Research and development in this area concerns theory, experiments and applications of DNA computing. DNA computing is fundamentally similar to parallel computing in that it takes advantage of the many different molecules of DNA to try many different possibilities at once. This field was initially invented by Leonard Adleman of the University of Southern California in 1994. Adleman demonstrated a proof-of-concept use of DNA as a form of computation which solved the seven-point Hamiltonian path problem. 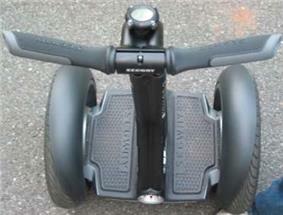 The Segway PT is a two-wheeled, self-balancing, zero-emission, electric vehicle used for "personal transport". Segways have had success in niche markets such as transportation for police departments, military bases, warehouses, corporate campuses or industrial sites, as well as tourism. The earliest patent resembling the modern Segway PT, U.S. patent #6,357,544, was filed on May 27, 1994 and issued to Dean Kamen on December 30, 1997. However, it wasn't until 2001 when Kamen finally introduced his invention to the public. A quantum cascade laser is a sliver of semiconductor material about the size of a tick. Inside, electrons are constrained within layers of gallium and aluminum compounds, called quantum wells are nanometers thick, much smaller than the thickness of a hair. Electrons jump from one energy level to another, rather than moving smoothly between levels and tunnel from one layer to the next going "through" rather than "over" energy barriers separating the wells. When the electrons jump, they emit photons of light. The quantum cascade laser was co-invented by Alfred Y. Cho, Claire F. Gmachl, Federico Capasso, Deborah Sivco, Albert Hutchinson, and Alessandro Tredicucci at Bell Laboratories in 1994. On April 4, 1994, the Bell Labs team filed U.S. patent #5,457,709 that was issued on October 10, 1995. A Bose–Einstein condensate (BEC) is a state of matter of bosons confined in an external potential and cooled to temperatures very near to absolute zero (0 K, −273.15 °C, or −459.67 °F). It was first conceptualized by Satyendra Nath Bose and Albert Einstein in 1924–25 and was produced in 1995 by Wolfgang Ketterle at MIT and Eric Cornell and Carl Wieman at the University of Colorado at Boulder National Institute of Standards and Technology Laboratory. The screenless hammer mill, like regular hammer mills, is used to pound grain. The screenless hammer mill uses air flow to separate small particles from larger ones, rather than a screen, and is thus more reliable which results in much more energy efficiency. The screenless hammer mill was invented in 1995 by MIT professor and engineer Amy B. Smith. An Xtracycle is a load-carrying bicycle. An Xtracycle may be constructed by modifying an existing bicycle with an extension called a Free Radical or by custom-building an extended-tail bicycle frame. While in the country of Nicaragua on a research grant, an American named Ross Evans began talking with workers, commuters, farmers, and engineers about their transportation needs and carrying large loads up to 200 pounds on their bicycles. Hence in 1995, Ross Evans conceived the idea and built the first Xtracycle. With his friend Kipchoge Spencer, Evans founded Xtracycle International. He graduated from Stanford University and has since introduced the Xtracycle in communities around the world in developing and poor nations such as Ghana, Senegal, and South Africa that rely on cheap and efficient modes of transportation. A scroll wheel, or mouse wheel, is a hard plastic or rubbery disc on a computer mouse that is used for scrolling up or down on a web page. It is perpendicular to the mouse surface and is normally located between the left and right mouse buttons. The scroll wheel was invented at Microsoft by Eric Michelman in 1995. On December 16, 1998, Michelman filed the earliest patent for a scroll wheel, U.S. patent #6,940,488, which was later issued to him on September 6, 2005. Adobe Flash is a multimedia platform created by Macromedia and currently developed and distributed by Adobe Systems. Since its introduction in 1996, Flash has become a popular method for adding animation and interactivity to web pages. The program Flash was invented in 1996 by Jonathan Gay while in college and extended it while working for Silicon Beach Software and its successors. A bait car is a vehicle used by a law enforcement agency to capture car thieves. The vehicles are specially modified with features including GPS tracking and hidden cameras that record audio, video, time and date, which can all be remotely monitored by police. A remote-controlled immobilizer is installed in the vehicle that allows police to disable the engine and lock the doors. The concept and technology was invented by Jason Cecchettini in 1996. Virtual Reality Immersion Therapy or VRIT is a method using specially encoded virtual environments and computers to evaluate and treat anxiety disorders such as acrophobia or PTSD. Conceived in the early 1990s by Dr. Ralph Lamson, VRIT was clinically proven and the key patent 6,425,764 was filed in 1997 for this major contribution to treatment of medical conditions involving sensory induced disorders by recreating such sensations in a controlled manner in an immersive virtual environment with feedback to achieve mastery over the causative sensations. An HVLS fan, which is an acronym for High-Volume-Low-Speed, is a type of rotational mechanical fan that moves large amounts of circulating air. In addition, HVLS fans have been found to be more beneficial than traditional HVAC fans as they are more cost effective as well as having a stronger cooling effect while helping to maintain a constant temperature and humidity. Using 10 overhead airfoil blades in a barn, the HVLS fan was invented in 1998 by Walter Boyd who was challenged to find a better means to reduce the heat stress of dairy cattle which in turn, would increase milk production. The Torino Scale, invented by Richard P. Binzel in 1999, is a method for categorizing the impact hazard associated with near-Earth objects (NEOs) such as asteroids and comets. It was intended as a tool for astronomers and the public to assess the seriousness of collision predictions, by combining probability statistics and known kinetic damage potentials into a single threat value. The phase-change incubator is a low-cost, low-maintenance incubator to help test for microorganisms in water supplies. It uses small balls containing a chemical compound that, when heated and then kept insulated, will stay at 37 °C (approx. 99 °F) for 24 hours. The phase-change incubator was invented in 1999 by MIT professor and engineer Amy B. Smith. A bowtie cotter pin is a formed wire fastener that resembles an R-clip, except it positively locks when installed. The bowtie cotter pin was first patented in 1999 by Rue S. Leitzke and Roman J. Baus. U.S. patent #6,135,693 was filed on March 23, 1999 and issued to Leitzke and Baus on October 24, 2000. The iBOT is a stable and mobile powered wheelchair that balances on two of a total of six wheels. The iBOT is capable of stair climbing as well as the user having the ability to make eye-contact with a standing individual. The iBOT was invented by Dean Kamen in 1999. Kamen filed U.S. patent #6311794 on October 27, 1999 and later being issued on November 6, 2001. A spin-exchange relaxation-free (SERF) magnetometer achieves very high magnetic field sensitivity by monitoring a high density vapor of alkali metal atoms precessing in a near-zero magnetic field. SERF magnetometers are among the most sensitive magnetic field sensors and in some cases exceed the performance of SQUID detectors of equivalent size. The SERF magnetometer was invented by Michael V. Romalis at Princeton University in 2002. Doggles are sunglasses for dogs in the form of tinted goggles designed to fit the shape of a dog's head. While marketed as a fashion item, several practical and medical uses have been reported, and prescription lenses for dogs with restricted eyesight are available. Doggles were co-invented by Kenneth and Veronica Di Lullo. They filed U.S. patent #6,863,032 for their "Animal Eyewear" on January 23, 2003 which was subsequently issued on March 8, 2005. A fermionic condensate is a superfluid phase formed by fermionic particles at low temperatures. The first atomic fermionic condensate was invented by Deborah S. Jin in 2003. Slingshot is a portable water purification device powered by a stirling engine running on a combustible fuel source. The size of a dorm fridge, the Slingshot is claimed to be capable of turning any water source such as urine, saltwater, and arsenic into drinking water. Dean Kamen invented the Slingshot. Kamen filed U.S. patent # 7,340,879 on November 13, 2003 for the device which was issued on March 11, 2008. A nanowire battery is a lithium-ion battery consisting of a stainless steel anode covered in silicon nanowires. Silicon, which stores ten times more lithium than graphite, allows a far greater energy density on a steel anode, thus reducing the mass of the battery. The high surface area further allows for fast charging and discharging. The practicality of nanowire batteries is reasoned that a laptop computer that runs on a regular lithium-ion battery for two hours could potentially operate up to 20 hours using a nanowire battery without recharging, which would be a considerable advantage for many people resulting in energy conservation and cost savings. The nanowire battery was co-invented in 2007 by Chinese-American Dr. Yi Cui, an assistant professor of materials science and engineering along with his colleagues at Stanford University. 2008 Bionic contact lens A bionic contact lens is a digital contact lens worn directly on the human eye which in the future, scientists believe could one day serve as a useful virtual platform for activities such as surfing the World Wide Web, superimposing images on real-world objects, playing video games for entertainment, and for monitoring patients' medical conditions. The bionic contact lens is a form of nanotechnology and microfabrication constructed of light emitting diodes, an antenna, and electronic circuit wiring. The bionic contact lens is the 2008 creation of Iranian-American Babak Parviz, an electrical engineer at the University of Washington (UW) in Seattle. Trongs are gripping and lifting tools which are made up of three limbs, or finger-channels, each with teeth on the end of them. They are generally made of polypropylene and are dishwasher safe. Trongs are designed for eating finger food such as buffalo wings and barbecue ribs so that the user doesn't get his or her fingers messy. They are used in pairs so that the user has one for each hand. Trongs were co-invented in 2007 by two New Yorkers, Eric Zimmermann and Dan Ferrara Jr. Zimmermann and Ferrara filed U.S. patent #12,682,890 on August 8, 2008 which was issued on February 24, 2011. ^ "Automotive wheel enhancers". United States Patent and Trademark Office. ^ "Active Pixel Sensor with Intra-Pixel Charge Transfer". National Inventors Hall of Fame. ^ "Active pixel sensor with intra-pixel charge transfer". United States Patent and Trademark Office. ^ "Molecular Computation Of Solutions To Combinatorial Problems". Science Journal. ^ "About Segway – Who We Are". Segway. ^ "The Team". Bell Laboratories. ^ "Unipolar semiconductor laser". United States Patent and Trademark Office. ^ "Bose-Einstein Condensation, A New Form of Matter". University of Washington. ^ "Screenless hammermill". Massachusetts Institute of Technology. ^ "Xtracycle". Massachusetts Institute of Technology. ^ "Computing History Displays: Fifth Floor – The Computer Mouse". University of Auckland. ^ "System and method of adjusting display characteristics of a displayable data". United States Patent and Trademark Office. ^ "The History of Flash". Adobe. 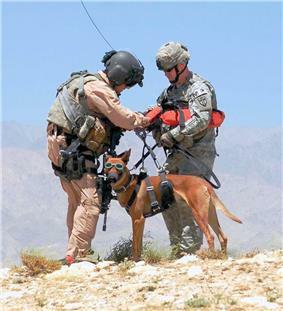 ^ "Virtualy Reality Battles PTSD 9 2011". CNN. ^ "HVLS History". MacroAir Technologies, Inc.
^ "About the Torino Scale". GNO, Inc.
^ "Student's low-cost solution aids high-tech problem in Africa". Massachusetts Institute of Technology. ^ "Bow-Tie™ Locking Cotter". Pivot Point. ^ "Bow Tie Locking Cotter". United States Patent and Trademark Office. ^ Life on wheels: the A to Z guide to living fully with mobility issues. Demos Medical Publishing. ^ "System and method for stair climbing in a cluster-wheel vehicle". United States Patent and Trademark Office. ^ Allred, J.; Lyman, R.; Kornack, T.; Romalis, M. (2002). "High-Sensitivity Atomic Magnetometer Unaffected by Spin-Exchange Relaxation". ^ No more dreaded Mondays: ignite your passion – and other revolutionary ways. Random House Digital, Inc.
^ "Animal Eyewear". United States Patent and Trademark Office. ^ "NIST/University of Colorado Scientists Create New Form of Matter: A Fermionic Condensate". University of Colorado. ^ Marketing of High-Technology Products and Innovations. Jakki Mohr. ^ "Locally powered water distillation system". United States Patent and Trademark Office. ^ "Sulfur in hollow nanofibers overcomes challenges of lithium-ion battery design". Stanford University. ^ "Silicon nanowire battery holds 10 times the charge of existing ones". Digital Journal. ^ "Vision of the Future Seen in Bionic Contact Lens". MSNBC. ^ "Babak Parviz: An Engineer With a Bionic Eye". United States Department of State. ^ "Time's Best Inventions of 2008". Time Inc. October 29, 2008. ^ "WING AND RIB EATERS FINALLY COME CLEAN THANKS TO NEW UTENSIL". PR Newswire. ^ "Food Handling Device". United States Patent and Trademark Office.